You can find the whole source code on my corresponding github repo. However, in order to replicate the system shown above you will have to create some blueprints (corresponding screenshots are included both in the previous link and this post). For this post, I’ve used Luos’s Four Elements Pack however any particles will suffice. Please note that based on the particles you will use, you may have to modify the Skill Class. Having said that, your particles may be differ. This post was created using Unreal Engine 4.12. A skills component class that is assigned to our character, which holds an array of different skills. This component acts as an intermediary between the character and his skills. *In case you’re developing a fairly complex skills tree, it is highly advised, to create a skill class as an abstract class and then create sub – class for each skill. So, let’s start our project! For this post, I have created a Third Person C++ Template project. Don’t forget to add the Skill.h reference right before the .generated.h include. So far, we have created a Skill class which has a max level of 3. 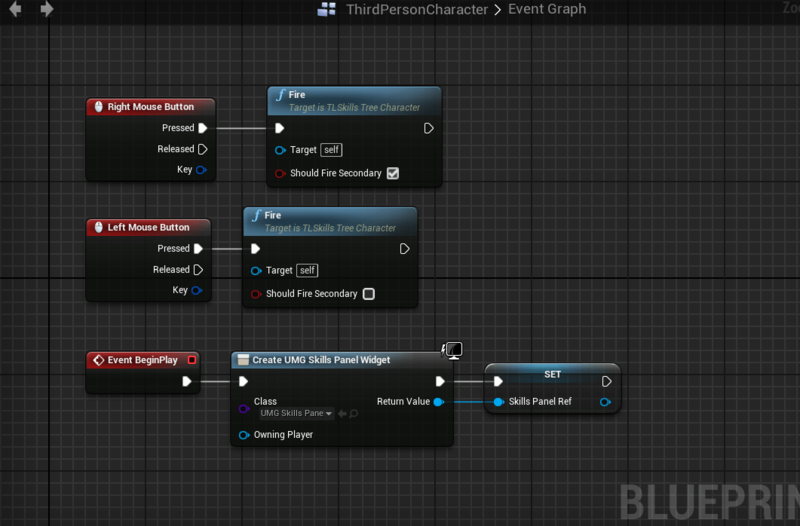 For this post, each skill level will be the number of skills that the character will spawn with a single button. Don’t forget to include the SkillsComponent.h header file before the .generated.h include. We will modify the transform of the spring arm components in the editor in order to achieve the desired spawn location of each skill level. //right on top of our character. We will get back on our character after we create some widgets first. Don’t forget to add a SkillReference variable, since we will use it later. Compile and save your widget. Make sure to set the marked items as variables. The WaterBlob and FireBall are both SkillWidget instances. The SkillsPanelRef is a SkillsWidget Reference. Compile and save your Blueprint. Then, test your result. Great tutorial but it is missing one thing – parent system. Currently system you have created can be called skill leveling/advancing system. A real skill tree is based on roots (called parents) which are needed to level up child skills. For example parent is FireBall and child is FireMeteor – bigger version of FIreBall. In terms of skill tree, common things are strong parents (all of them are needed to level up child) and weak parent (one of them is needed). That system give’s ability for developer to make branches of skills and in effect – skill trees. You can make it, for example, by creating TArray’s: WeakParents, StrongParents, and check if skills in them are mastered when advancing a level. You have a valid point, however depending on your game you may or may not need to create a parent (see Torchlight for example). That’s why I mentioned in the top of the post that this is not a complete game system. SetLifeSpan(DestroyDelay); ? =) Thanks for tutorials.